What is public transport like in your area? Post subject: Re: What is public transport like in your area? I live in Noord Brabant, the Netherlands. Public Transit here is alright. Where I live, a rural town, busses run regularly and even run until on weekdays. There are two bus lines, although one is on the other side of a semi-large town. The bus takes me straight to the train station. The train I need on my commute to university runs every 10 minutes. Of course, the bus company planned their busses such that I always have to wait the full 15 minutes because the train timetable is awkward. In the afternoon, I sometimes have to wait 20 minutes for my bus, for this exact reason. My university is in Eindhoven, the 5th largest city in the Netherlands. Eindhoven has a lot of busses and it really isn't clear which bus goes where or where or when I can expect this bus, which is why I never take the bus in Eindhoven. As a student, I can use all forms of public transport for free from monday through friday, and get a 40% discount at all other times. You pay for all your public transit needs with your OV chip card. With an OV chip card I can go from home to the nearest large city and back for like €4 (assuming no discount) but it would cost me €7 if I would want to buy a paper ticket. Train tickets are a lot cheaper. It's about €7 from the nearest large city to Eindhoven. It takes me an hour to get to uni every day. Overall, I recommend getting a bike over taking the bus, especially as busses often don't go to where you want. But the train's alright. We have decent bus service here in the Black Country...but not enough bus lanes so the majority of buses just sit in traffic jams with the cars. 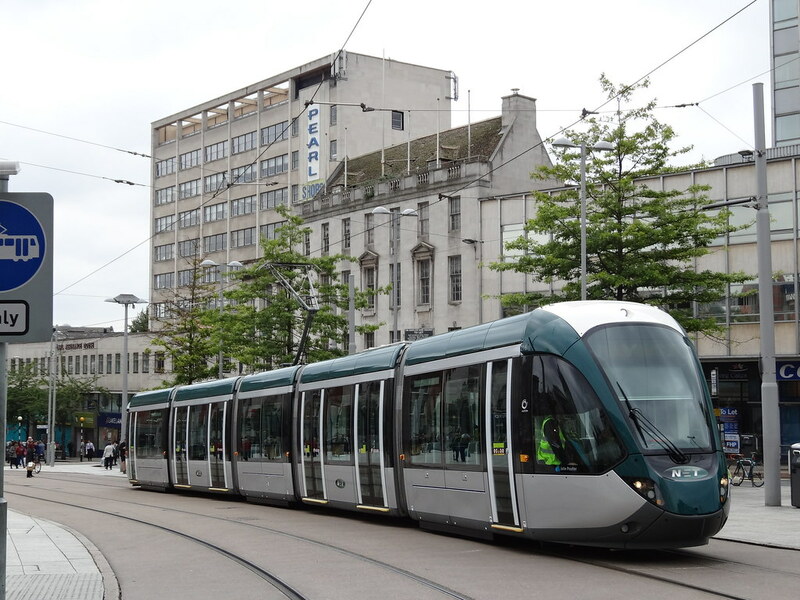 We have a tram line, which has become really useful since it was extended into the streets of Birmingham City Centre. But the trams take too long sometimes getting through the signals on the Wolverhampton road section and frequently get blocked by traffic at some of the poorly thought out junctions there. But new tram extensions are on the way so that's a really good thing. The Dudley one will be really useful for me. My nearest railway station is Coseley, but I have no direct bus there. However, the local taxi firm only charges us a fiver to get there which is useful when we both go or we have luggage. I come from the land of TriMeth. Oh sorry, I meant Trimit. Oh damn, I mean Trimess. Oh, wait, those are the actually applicable and fitting names... OH RIGHT - TriMet! The "Transit Mecca Of The World" according to their top dogs who make over $200k bucks per year after taxes, not including all the bonuses & 5 star luxury vacations they get for sitting on their fat a***s doing nothing at all. The land of Anti-Bus, and Light Rail Only. MAX is the only option ever to them, just so they can keep forcing massive, wide-spread gentrification across the metro area. Horribly unreliable, no one wants MAX anymore, and we get it forced on us against our wills and votes every single time they propose another stupid MAX Light Rail line. And every time, BILLIONS OF DOLLARS OF OUR TAX MONEY PAYS FOR THEM. The latest is the Purple Line MAX. The ridership & residents unanimously rejected the line's proposal, and demanded Bus Rapid Transit instead, along with focus on improving pre-existing bus service across the region it would serve. They do not maintain their buses, and the newer the buses, the chintzier and more horrid quality they are. The oldest buses, which are 2200-2800 series buses are the most reliable and quality built by far. In the summer or winter, these older buses are the most heavily utilized because they know as well as riders that their newer & newest buses, their 3000-3700 series Gilligs WILL consistently breakdown or have mounting issues. The old buses? Weather ain't got nothing on them. Reliability in terms of on-time performance for buses is also gruesome. You can end up waiting up to 45 minutes to an hour for a single bus - whether the driver didn't care to start the route on time, or a bus broke down, got re-routed/detoured, or taken offline for whatever reason, and typically without any forewarning or notice to riders. Typical arrival times are consistently 5 minutes early or 10-15 minutes late. If a bus is on time, that is one of the most bizarre and trippy experiences as a rider to have as it is so incredibly seldom. This famous lack of reliability has business managers and owners taking on nearby residents who rely on TriMet to get them there because they're the right fit and hard workers on the job, but typically end up letting them go with regret, since they cannot rely on the person to arrive on time with any consistency due to TriMet. TriMet is literally why almost every job in the entire Portland Metro area of Oregon has the Driver's License requirement, bundled with "Must have a reliable form of transport". As for the MAX light rails, they are an archaic, intentionally misused mode of transport here in the land of TriMess, and run into the predictable issues like switch issues, lift issues, electrical issues with the telearm and/or catenary, doors failing, overcrowding, crossing malfunctions, and weather problems. In the summer, the heat only allows up to 30mph max speed of travel. The winter, the rains, wind, snow & ice tends to cause plenty of consistent issues as well. Light rail overall in general makes no sense, and simply is VERY outdated and inefficient. It is also lethally expensive. The future is bus. If the US' "Transit Organizations" (they're really Giant Multi-Governmental Corporations POSING as "Transit Orgs") paid any attention to ridership demands and feedback, as well as took Hungary, the birthplace of Light Rail & Trams, and the place where they were "perfected", they'd actively avoid Light Rail and get rid of their existing light rail systems. Hungary has gotten rid of all but a single light rail in Budapest because they themselves noted "The Future is bus, and light rail is outdated and no longer a viable form of transportation." They are actively replacing all light rails with new bus services. In the US, Light Rail is completely misused, with pure intention as well. Light Rail was made for, and perfected for being used STRICTLY within HEAVILY URBANIZED cores of cities in a SMALL LOOP pattern to be used as a compliment to BUSES. NOT AS A HIGH-SPEED INTERCITY RAIL SYSTEM. But, the US said, "Hey you know that Light Rail mode of transport? And how we want Intercity Commuter Rail systems? Well, let's completely abuse light rails, and use them in place of high-speed heavy commuter rails as our version of Commuter Rail systems!" Proprietary corridors. That's all Commuter rails can do. A single, semi-isolated line. And, Light rail trains can only be a maximum length of 2 cars. That's it. They can only be at closest to each other, 3 miles apart. They tend to hold about 480 in two cars at max crushload capacity. Not a intelligent concept. Bus Rapid Transit can go almost anywhere in just about about any way you want it too. It is nowhere remotely close to being so restricted and proprietary as LRT. And BRT buses likely would be articulated buses. Most Articulated buses here in the us can hold up to about 100-120 people at max crushload. They can be at closest 500 feet apart from each other. LRT transit costs on average $1B USD to build a new line, not counting train purchases. The trains tend to cost between $4M-$12M USD. Running costs are exorbitant as all hell. BRT costs on average about $20M-$60M USD to implement each new line, if one is refitting the road systems to have Bus Only lanes, counting adding moderate to high quality bus stops with cover & a bench. Running costs are also FAR cheaper. In terms of maintenance costs between LRT & BRT - there is no contest between BRT & LRT - BRT is BY FAR the cheapest of the two on that front, once again. Also, BRT tends to be FAR more reliable than LRT. So, which mode of transit would YOU choose to have implemented? Most of us TriMet reliant riders have gotten so fed up with them, and their refusal to care let alone listen to anything we request, say, demand, what have you, I personally believe we're on the brink of storming the HQ in an tidal wave fashion, and refusing to leave until the top dogs all step down in our demand, and we replace them with people we know we can trust to focus on us riders first, and capital interests dead last, if at all. So, as you probably can gather, the transit system here in the Portland Metro of Oregon is abhorrent. Sorry for all the excessive detail and rant, but, as a fanatic of REAL transit, it's hard not to just let loose consistently when I've been given the opportunity. For those who have read this entire thing, I apologize haha, but I hope you learn from it, and/or found yourself interested or entertained at some point. Also as an aside - My avatar is one of MANY TriMet memes made by ridership and former drivers & employees. This one in particular is made by a former longtime driver turned watchdog/critic of them. It is interesting, though to hear people's actual experiences, rather than what has been written down by people who either have never visited those areas, or just write how they think it is. The land of Anti-Bus, and Light Rail Only. If anything, apparently you don't have enough of both Light Rail and Busses. I can't tell if you're trying to be sarcastic here haha. If so, thank god, if not... well I'll have to slam my head in a steel door for the remainder of this epoch. Light Rails ARE the problem here, in which they also are the direct and only contributor to TriMet attempting to get rid of bus services, cut bus service and anything else to inhibit buses intentionally so they can in their mind use this intentional messing with the buses to then push light rail "since your buses aren't very reliable, you clearly need more light rail". I also already in my ranty post explained exactly why the world needs to dump off & rid themselves of Light Rail Transit. It's either purely for gentrification en mass, or, for mere aesthetics, nothing more, nothing less. Buses will always be the most intelligent, useful & rideable form of transit, as well as by far the most accessible & moldable too. You can take a bus route ALMOST ANYWHERE. YOU CANNOT DO THIS WITH TRAINS OF ANY KIND. Whether it be Light Rail, Commuter Rail (which is the US' excuse for Light Rails), heavy rails (interstate/province, transnational, transcontinental), Metro systems, Subways, Monorail, etc. And, in the era where electric rails are key, but Mono is the most "upscale", they both also have their stupid wires all over the place, or, have their tracks everywhere, which are both extra expenses, and very counter-intuitive. I have studied mass transit to the point of off & on engrossment for nearly my whole life, no matter where in the world it may reference and speak on. And one of the very first things you'll learn when doing so without allowance of any sort of politics or personal opinions is simple. It's that Light Rail is beyond obsolete and archaic, and is not a positive form of transit any longer, and hasn't been since about 1990. And, the cheapest and most logical, well ridden and received form of transit with the most customization uses is Buses. It will always lead you back to buses as the best all around form of mass transit. On a differing note however, around here people have been talking about wanting to put in a Metro or Subway system into the Portland Metro. This is by far the most mindwarpingly obscene proposal for this region I have ever heard. Creating a giant hover-bat would work far better and be far less of a logistical nightmare and hazard than such systems being implanted here. The main logistical nightmares are obvious, yet not paid almost any attention to by people. Those are the main four reasons why it is beyond idiotic to even ponder the thoughts of implementing such forms of transit here. Plus, once again, it is BILLIONS OF DOLLARS just to get to the point of breaking ground on construction. Then, HUNDREDS OF BILLIONS OF DOLLARS TO BORE TUNNELS - The tracks will cost tens and hundreds of millions as well. How's this even remotely likable let alone logical I will never even begin to comprehend. To me, it just isn't - it is nowhere remotely near making any kind of logical sense. And light rail already costs about $1B-$5 BILLION DOLLARS PER LINE BUILT. 95-98% ALL OUT OF TAX PAYER'S WALLETS. Oh yeah, that's totally fair. But the point being, when we don't like light rails nor commuter rails, and we already are forced against our wills and votes to have new light rail lines built anyway, and pay those immorally heinous amounts of money to build them, simply because our government is infatuated with them - why in all hell would we EVER even begin to consider the idea of paying out HUNDREDS OF BILLIONS on stupid metro or subway systems when we know we will be forced to pay the mass majority of the multi-hundred-billion dollar bill? As I noted at the end of my previous post here, I could go on and on and on and on with just about anything mass-transit. But at least for this post, this is FIN. Railways are almost the best public transport ever - capable of high capacity, high speed, and high punctuality. If I want to go accross the city, I get myself on the train; if I just want to go to the local market, just walk, get on a bike, or the countless share taxis (local bus for you). A carefully planned light rail networks should be able to coexist (in fact, cooperate) with local-area busses. You have more "highways" (Interstates, grade separated US & state routes etc) than light rails route. That's telling something. I completely disagree with this comment. In Manchester, we converted several former heavy rail local lines to light rail, with extensions through the city centre as well as on roads to Ashton, Eccles and Manchester Airport (each one of these places has a heavy rail connection to the city centre as well). This conversion rejuvenated the lines themselves and has actually provided a benefit in Public Transport to all areas served. I grew up in a place called Sale, in South Manchester, which receives a regular light rail service every 6 minutes (during weekdays) which run between Manchester City Centre and Altrincham. Each one of these LRVs can carry 206 passengers, and can be paired to give a total capacity of 412 passengers. Alongside the light rail on this route is a competing Bus route, which runs every 15 minutes, these Buses can carry about 60 people each. The 10 LRVs per hour (half single units, half double units, as per the lines schedule) provide capacity for 3,090 passengers, and are regularly busy at all times of the day, whilst completely full in the peaks. By comparison, you would need to run over 50 buses an hour to allow that amount of people to be moved. Not to mention the Bus route itself is already somewhat busy too. Additionally, the Light Rail on it's own separate right of way is able to run at speeds of up to 50mph, by comparison, the Bus route is on roads with a maximum speed of 40mph (the majority of which are 30mph, and some are even as slow as 20mph), and has to deal with the congestion of the roads, many of which are near a standstill due to the sheer amount of traffic. Even on areas where the Light Rail does share with road traffic, the LRVs are given priority over other traffic. This allows the LRVs to be more reliable in regards to on-time performance when compared to a bus. Another thing for me to mention is, I am a big critic of Manchester's Metrolink system. It doesn't serve enough places, it doesn't have enough capacity, Cornbrook likes to break every now and again, etc. 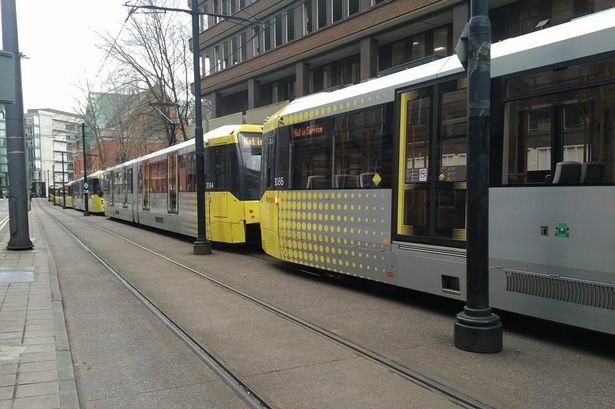 But, compared to the buses, the Metrolink is a wonderful system which has helped public transport in Manchester massively! Point 1) Are you sure? 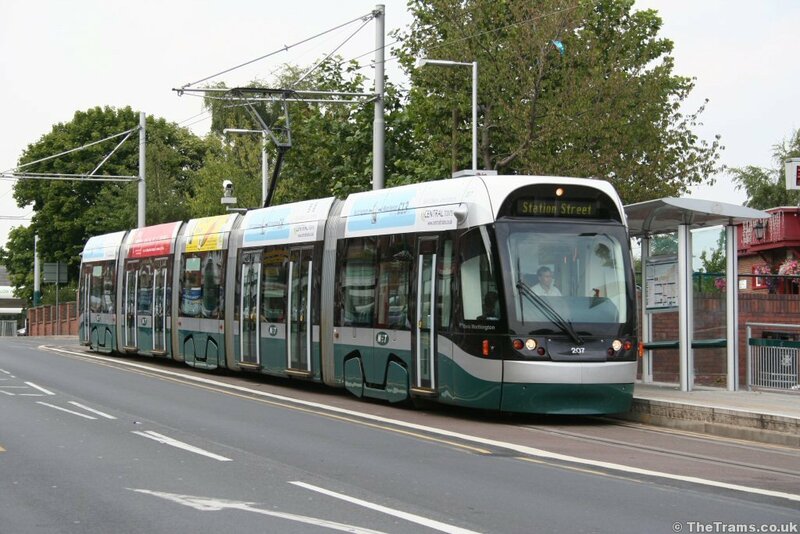 May I point you towards this image of a Nottingham Tram/Light Rail vehicle? As you can see, that is made up of 5 cars. Just because your system doesn't have more than 2-cars, doesn't mean it's not actually possible. Point 2) Many parts of our light rail network (in Manchester) are run under line of sight except for major junctions where there are conflicting moves. This means we could literally have LRVs end to end if we so desired. Much like this. You'd struggle getting a bus full in the US. Nor are the cars. But the road is. I'd love to know the source of that. That seems a very inefficient way of running a system. Especially compared to ones I know do otherwise in the UK. I live in the smallest state in the US, Rhode Island, which is about 77km across at its longest point. We have public buses that go to just about every town, though you'll have to plan for a long wait and ride. We also have 3 stops on the Massachusetts Bay Transit Authority commuter rail - basically, commuter rail to Boston. We have an Amtrak station (both regional and high speed rail), an International airport and several smaller airports. We also have ferries going to a few island communities off the coast or across Narraganset Bay, though many of those are seasonal. Do they come every other minute, or every other hour ? Also, given LaGuardia, you probably live somewhere near New York, which has decent density for most part. Portland, and cities in the South West comes nowhere close with their mansion sprawl. Buses at LGA are nominally fairly common, about every 10 minutes per route. The volume of passengers and luggage, and the service pattern around the terminals leads to them getting very full. Portland is actually reasonably dense by US standards (NYC does not fall under 'US Standards' as it is an outlier in too many ways). I refer more to cities like St. Louis or Columbus. Very little of these bus networks serve the outer suburbs at all, but in the denser inner neighborhoods capacity is generally well matched to demand or exceeded. ... And that's what our fellow Portlanders (?) are complaining about. Because now they have to fund the light rail, the bus is reduced, with overall funding stays the same. Ain't a problem with the light rail, problem is with funding levels. I have a somewhat limited experience with the Paris Metro (mostly Line 4), as well as the RER myself. I must say, I was quite impressed by it. Even on a strike day, they managed to run a decent service, and they also had free travel, due to air pollution I believe (16th December 2016). They got me to the airport on time, albeit to the wrong terminal and I had to get the CDGVAL to the correct one, but even so, can't really complain too much. Better than most services here in the UK when strike action is taking place. And this is at a main station (equivalent to Monument for you Londoners). Don't dare saying after that we have a good subway system. There's worse, like in Roma, with some stations that are empty, old trains etc that really make it creepy. Hey ACS, welcome to every single metro system in the world. Of course it's going to be busy at 1600 on a weekday, and even more so at a major station! Just because it is busy, does not mean it is a bad system. In fact, the very fact it is so busy is probably because it is a very good, popular system! Hey...i know all metro systems are busy. Just look at the state of the roofs. Also look at all mendicity around. In no London station i saw this much homeless people in the subway. Clearly not been to the right (or wrong) stations then. Also, that's more a reflection on the city as a whole. The qualityif the tube can widely vary depending on which line you're on. For example, the Central or Victoria tend to be rather well kept where as the bakerloo isn't so much. I'm sure the same is true of Paris. Here we're talking about a single station which is home to 5 lines. Of course there are lines that are much more well kept than others. Lines 1 and 8 are well kept, where as the line 11 isn't very well kept.